I only recently discovered Thread Faction’s grow-with-me pattern line, which Liz of Thread Faction is expanding. What a really fun idea since babies and kids grow so quickly! Let me just start by saying these patterns are seriously the perfect gift to make young children. You don’t even have to worry too much about their size! 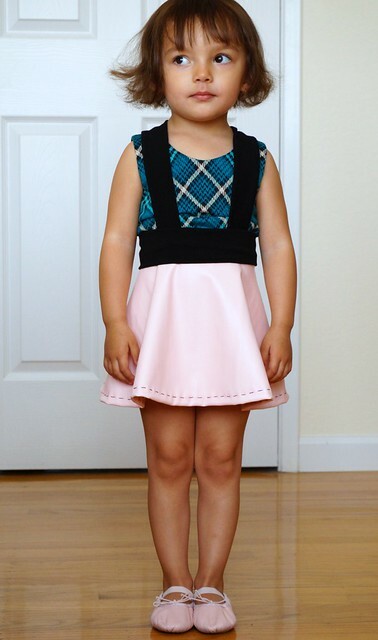 I tested #112, the grow-with-me baby and toddler suspender skirt for my littlest one. Size 1 fits approximately 9 mos-3 years and size 2 fits 3-6 years. My little one is approaching 3, so she’s at the top of the size spectrum for size 1, which is what I made her. This is one of the quickest sews ever and most of the construction was done on my serger. I made my first test version with this really fun zebra print from Girl Charlee and the hearts knit is from JoAnn’s. The waistband fabric has to have a lot of stretch and good recovery too to accommodate a wide range of waist sizes comfortably. 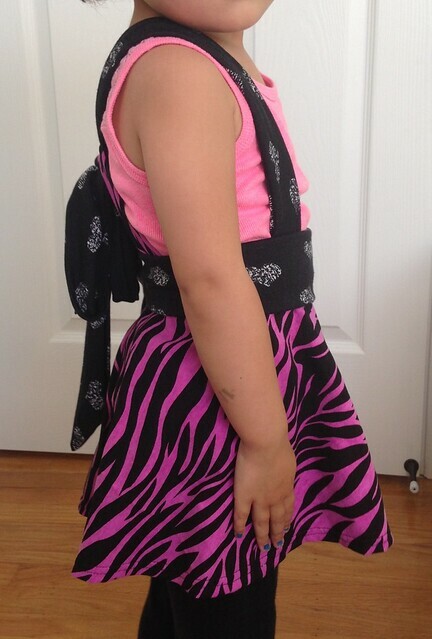 Surprisingly my girl loved the suspenders, and the bow in the back is adorable. The skirt also provides lots of necessary twirl! She was so happy with it, she gave it two thumbs up and a little wiggle too! My final version I made with some vegan leather I picked up awhile back, also from Girl Charlee. I was going to use it for a bag, but I decided it would look adorable as a skirt. I hand stitched the hemline which took awhile, especially to keep it even, but I love the look of it. The drape was better before hemming though, so I think when I make my big girl’s version I’ll leave the raw hem. 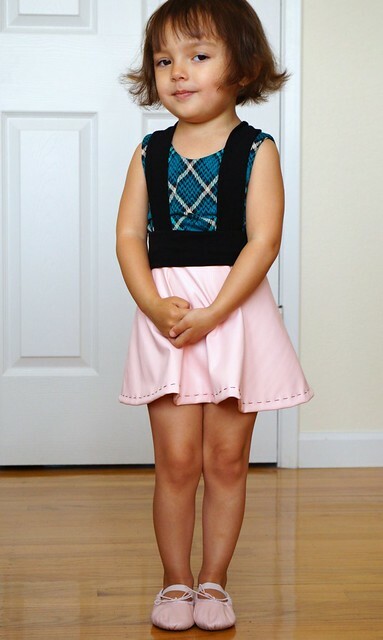 The top is the Skola Top by E&E Patterns in another jersey print from Girl Charlee. The fabric is a bit strange in that it just static clings to itself. It’s almost like kitchen cling wrap, but I really love the colors, and it’s very soft too! I will definitely be using this pattern to make as gifts though. I always stress about whether or not what I make will fit the little cutie, or how long it’ll fit since they all grow so quickly! The size is adjusted by folding the waistband and also by adjusting the straps. 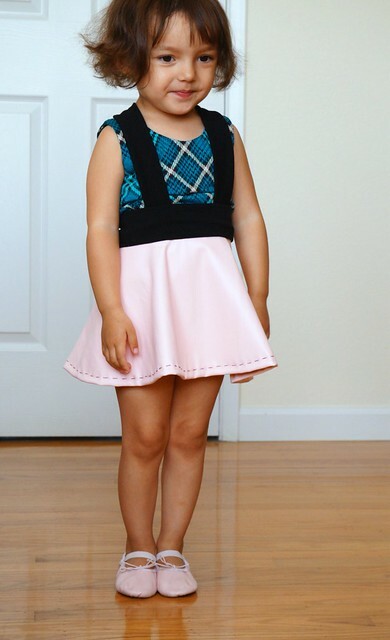 The bow in the back just pushes the cuteness over the top, making this such an adorable and quick sew. I can just imagine this with a knit panel top…I just ordered the cutest Korean cat panels too (I ordered mine from a different shop, but this one is still available too, and super cute!). Also, you could always omit the suspenders and just make it a skirt with yoga style waist band, which I also plan to do too. I can’t wait to see what other grow-with-me styles she’s going to come out with. I wish these were around when my girls were babies; I would’ve made tons of them! What do you think? Perfect baby gift, am I right? !